We strive to give you financial peace of mind. Since 2008, banks are lending less to corporations and individuals due to regulatory and compliance reasons. With banks lending less money, small businesses and entrepreneurs are seem to be shifting their focus to new sources of funding. Forefront's goal is to step in and fills this financing gap by providing credit to small and middle market businesses with an emphasis on risk management. Forefront has the resources and expertise to originate and structure highly collateralized, senior credit opportunities. We invest in short duration asset backed business loans. These niche loan opportunities are structured to mitigate the risks that are normally associated with high yielding returns. Our edge comes from our ability to originate and structure collateralized direct lending opportunities. Typically direct lenders buy loans via secondary markets. We originate our lending opportunities which allows us to control every component of the loan structure. This differentiating characteristic gives us the opportunity to add key features to the investment, reducing counter-party risk and ensuring timely repayment. Risk is our primary focus. Our extensive internal due diligence process is coupled with experienced third party partners to identify all of the risk factors in the transaction. We then structure the investments accordingly. In addition to the overcollateralization of our loans, some of our loans are able to principally insured up to 90%. Factoring is the process of buying accounts receivable at a discount. For example, if a business needs immediate capital and cannot wait for their invoice to be paid, then a discounted amount of money is advanced to the business and the invoice is paid directly to the lender, usually by a large trusted company. Supplier Credit is a way to give a customer better repayment terms on goods purchased. 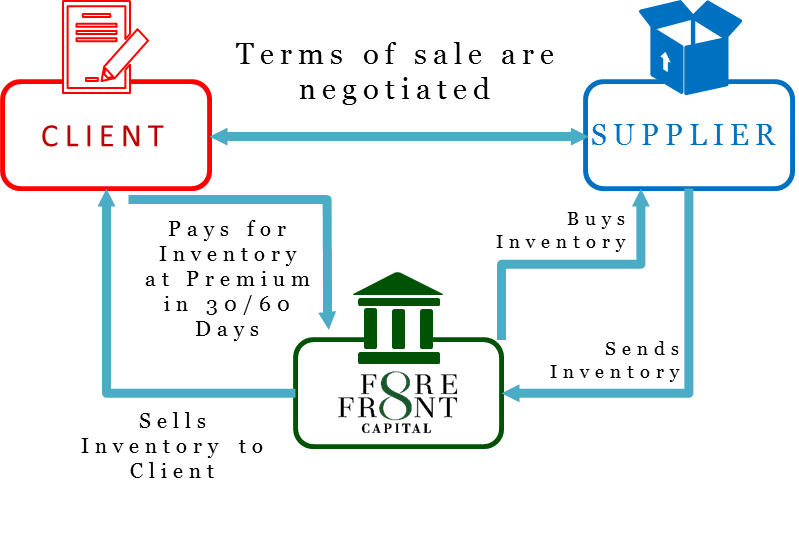 The lender will buy inventory from a supplier and immediately resell it to a customer, creating an account receivable with the client. The client will pay the lender a premium for extended repayment terms and most often credit insurance can be used to insure the principal plus the interest in this transaction. Forefront Capital Advisors, LLC is an SEC Registered Investment Adviser. Registration with the SEC does not imply a particular level of skill or training. For more information regarding the firm, please see its Form ADV on file with the SEC. There is no guarantee that any investment product will achieve its objectives, generate profits, or avoid losses. Investing involves risk of loss and alternative investments may not be suitable for everyone. Before investing, consider your investment objectives.